Ophthalmologist DOUG WILSON grew up memorizing the backs of baseball cards and dreaming of the big leagues. 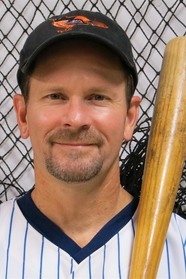 A member of the Society for American Baseball Research, he has written three previous baseball books. He and his wife, Kathy, have three children and live in Columbus, Indiana. He still haunts the softball fields of Columbus, Indiana as a left-handed shortstop. "I want to write about the good guys of the game of baseball--there is enough out there on the scandals, steroids and boorish behavior by players. I want to bring the good characters back to the forefront. I enjoy researching details and numbers to make sure everything is accurate, but my books are much more than just numbers. I like to write about the personalities of the players and what drives them. The best part of writing the books is interviewing the ex-players and listening to their stories. "Wilson is the author of The Bird: The Life and Legacy of Mark Fidrych and Brooks: The Biography of Brooks Robinson.